This two-story Second Empire home was built in 1875 by Henry Hudson Beck, a businessman, member of the Territorial legislature of 1864 and an assemblyman in the state legislature (1865, 1874, 1888, 1894). Beck had immigrated to Carson City in 1860 and began manufacturing shingles in the mountains above the burgeoning town. He assisted in construction projects but later began selling shoes. His business flourished into a general mercantile enterprise. He then married in 1869 and had four children, requiring a large family home. 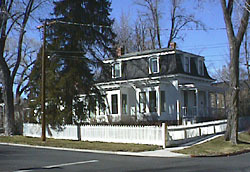 The house is one of three remaining examples of the Second Empire architectural style in Carson City. This style was prominent in American residential architecture between 1860 and 1880, although less common in the far West. The house gains visual prominence by its uphill siting on a large hillside lot. The house was subsequently sold to the Barber family in the late 1870s. Oscar T. Barber was a Comstock-based merchant and a member of the Nevada State Assembly (1870). Barber's business in Gold Hill is listed in the Virginia & Truckee Railroad 1873-1874 directory as "Barber O.T. & Co., dealers in hardware, stoves and tinware, mill and mining goods, Main St. . . " The home was then purchased in 1881 by Nevada Supreme Court Justice Charles Belknap and his wife Virginia. After being admitted to the State Bar of Nevada in 1869, Belknap practiced law in Austin (central Nevada) and Virginia City for six years. During this time, he also served one term as Virginia City Mayor. Belknap was then appointed secretary to Democratic Governor Lewis Bradley (1871-1878), and is credited with assisting the governor pass the Mining Act of 1871 which levied a tax on mines. This tax is still a major source of revenue for Nevada. In 1872, Belknap was appointed to fill a vacancy in the Nevada Supreme Court. He later ran successfully for re-election. He married Governor Bradley's daughter, Virginia, at the Governor's residence in February 1873. The Belknaps resided here from 1881 until they moved to California in 1908. 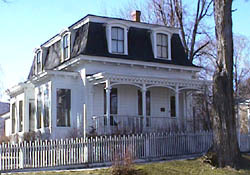 The Belknap House is located at 1206 N. Nevada St. in Carson City. It is privately owned and not open to the public.